Another negative consequence of modern methods of grape cultivation has been soil compaction. This phenomenon is linked to mechanisation, particularly the continual use of tractors and other heavy machinery over long periods of time. This is a common issue in Burgundy, resulting in observable soil erosion, restricted root development, and diminished soil life in general. It simply impossible for any form of life to thrive in tightly packed soil. 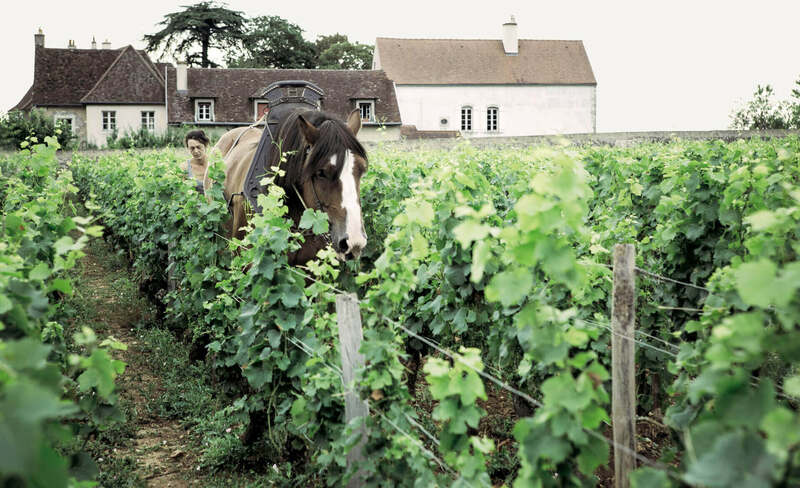 In 2004, the Domaine began to address these problems by returning to the use of horses for ploughing. Herve’s daughter Bertille received special training to implement this commitment and now she uses her two horses, Nougat and Oka, to plough all of the Estate’s Premier and Grand Cru vineyards. These 5 hectares are also pruned by hand. Even a quick examination of the vineyards reveals the benefits. The soil has come back to life, and its texture is marvellous. The vines thrive and the wines they yield give full expression of their unique places of origin.